They prey on people’s fear, threatening arrest for a missed summons for jury service. They are jury scammers, and they crop up with enough regularity to keep federal court personnel continually on the alert. Recent scams in federal courts in North Louisiana are typical of the fraudsters. Callers impersonating court officials, U.S. marshals, or other law enforcement officers telephoned random victims to try to convince them to pay a fine to avoid arrest for failing to appear for jury duty. The callers insisted that their victims bring cash or prepaid credit cards to the courthouse where they arranged to meet them, or to Wal-Mart where they are instructed to purchase a money order. Natchitoches City Marshal Randy Williams said the local calls use Judge Dee Drell’s name. Williams said he contacted Judge Drell, a District Judge, and verified the use of his name has been used in the Shreveport area and is now being used in Central La. “Judge Drell wants the public to know this is a scam and no calls will ever come from his office, or from the Marshal’s office,” Williams said. A court will always send a jury summons by U.S. mail and will never demand payment or sensitive information over the telephone. In most cases, a prospective juror who disregards a summons will be contacted by the court clerk’s office and may, in certain circumstances, be ordered to appear before a judge. A fine may be imposed but not until the court appearance, during which an individual has the opportunity to explain a failure to appear. Fraudulent callers sometimes disguise their phone numbers so that they appear to be court or law enforcement numbers on the recipients’ caller ID; they also sometimes transfer victims during the calls to create the illusion that they are speaking with government offices. 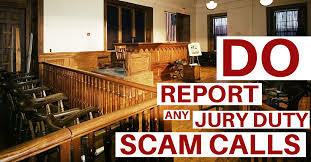 Scams are continually becoming more elaborate, making it much harder for anyone unfamiliar with the jury summons process to identify a scam. Impersonating a federal official is a federal crime punishable by a jail terms or a fine, or a combination of the two. Anyone who believes they may be a victim of a scam should not provide the requested information and should immediately notify the Clerk of Court’s office of the U.S. district court in their area, as well as local law enforcement.